"Don't Forget Me (When I'm Gone)" is a song by Canadian rock band Glass Tiger. It was released in January 1986 as the lead from their debut album, The Thin Red Line. The song reached number-one in Canada and number 2 in the United States. The song features backing vocals by rock singer Bryan Adams. In 1985, Glass Tiger chose Jim Vallance to produce the band's debut album. At the time, Vallance was primarily known as a songwriter, having written most frequently (and successfully) with Bryan Adams (who can be heard providing background vocals towards the end of this song). He also had some previous production experience, having produced one album apiece by Adams, Doug and the Slugs and CANO in the early 1980s. The band's lead vocalist Alan Frew recalled: "It worked out great because we were all at the same stage of development. He didn't change the sound of the band at all. He let us experiment but wasn't afraid to get heavy-handed when he had to." Vallance composed "Don't Forget Me (When I'm Gone)" with the band, while Adams provided backing vocals. Frew - "On the very first day that we met Jim Vallance, he picked us up at the airport and to break the ice asked us what we were listening to. One was Tears For Fears. We went to his house and drank tea and listened to some tunes. 'Everybody Wants to Rule the World' came on and we really liked the shuffle beat. So we went into the studio and based on this shuffle beat, we wrote 'Don't Forget Me (When I'm Gone)'. First day, first song." "Don't Forget Me (When I'm Gone)" topped the Canadian Singles Chart in March 1986, and spent two weeks at number 1. The single was certified platinum by the Canadian Recording Industry Association in July. The song entered the U.S. Billboard Hot 100 in July, peaked at number 2 in October - kept from number 1 by Janet Jackson's "When I Think of You" - and spent 24 weeks on the chart. It reached number 1 on the Singles Sales chart and number 6 on the Hot 100 Airplay chart. The song also peaked at number 17 on the Mainstream Rock chart, number 30 on the Adult Contemporary chart, and number 34 on the Billboard Year-End singles chart of 1986. The single reached the top 10 in Australia, number 27 in New Zealand, number 29 in the United Kingdom, and number 40 in the Netherlands. Frew credited the song's chart performance to "solid record company involvement" and the band's international appeal. "We aren't rewriting musical history by any means," he added. "But our melody lines are strong and mature enough to appeal to the English-speaking world." The song won the 1986 Juno Award for Single of the Year, and was named top Canadian single in the Rock Express magazine readers' poll awards in 1987. In 1996, the Society of Composers, Authors and Music Publishers of Canada honored the song for airing more than 100,000 times on Canadian radio. Glass Tiger performed the song during an episode of the 2005 NBC reality television program Hit Me, Baby, One More Time. The song's original music video, made for the Canadian market, mixed performance footage with a storybook concept. Directed by Rob Quartly, the video was nominated for Best Video at the Juno Awards of 1986. This version was the first video to air on the MuchMoreRetro digital cable music video channel when it launched on September 4, 2003. A second video was created for other markets, according to Manhattan Records Vice President of A&R Bruce Garfield. He noted that "Steven Reed, our senior vice president of marketing, took a very strong stand because the Canadian video was too cutesy and directed solely toward the youth market." Garfield added, "It didn't focus enough on the artistic integrity and entertainment aspect of the band." The newer version received heavy rotation on MTV. ^ a b LaPointe, Kirk (1986-07-05). "Glass Tiger Roars Onto Canadian Scene". Billboard. Nielsen Business Media, Inc. 98 (27): 70. Retrieved 2009-12-27. ^ a b "RPM 100 Singles". RPM. RPM Music Publications Ltd. 44 (1). 1986-03-29. ISSN 0315-5994. Retrieved 2009-12-27. ^ "RPM 100 Singles". RPM. RPM Music Publications Ltd. 44 (2). 1986-04-05. ISSN 0315-5994. Retrieved 2009-12-27. ^ LaPointe, Kirk (1986-08-23). "New Artists Dominate CRIA List". Billboard. Nielsen Business Media, Inc. 98 (34): 71. Retrieved 2009-12-27. ^ a b "'Don't Forget Me (When I'm Gone)' - Chart history". Billboard (Nielsen Business Media, Inc.). Retrieved 2009-12-27. ^ Whitburn, Joel (2004). The Billboard Book of Top 40 Hits (8th ed.). New York: Billboard Books. p. 257. ISBN 978-0-8230-7499-0. ^ a b c "Glass Tiger - Charts & Awards - Billboard Singles". Allmusic (Rovi Corporation). Retrieved 2009-12-27. ^ "Top Pop Singles". Billboard. Nielsen Business Media, Inc. 98 (52): 9. 1986-12-27. Retrieved 2009-12-27. ^ a b "Hits of the World". Billboard. Nielsen Business Media, Inc. 98 (51): 58. 1986-12-20. Retrieved 2009-12-27. 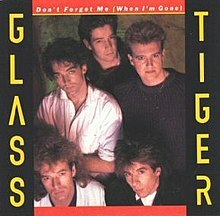 ^ a b c d "Glass Tiger - 'Don't Forget Me When I'm Gone'". Ultratop. Retrieved 2009-12-27. ^ a b Warwick, Neil; Kutner, Jon; Brown, Tony (2004). The Complete Book Of The British Charts (3rd ed.). London: Omnibus Press. p. 461. ISBN 978-1-84449-058-5. ^ a b c d e "Glass Tiger Succeeds South of Canada's Border". Billboard. Nielsen Business Media, Inc. 98 (49): 22. 1986-12-06. Retrieved 2009-12-27. ^ Griffin, John (1986-11-11). "Juno Award Winners". The Gazette. p. A-11. Retrieved 2009-12-27. ^ "Glass Tiger Sweeps Top Three Awards in Magazine Readers' Poll". Ottawa Citizen. 1987-02-19. p. E6. Retrieved 2009-12-27. ^ "SOCAN Awards Canada's Songwriters". Billboard. Nielsen Business Media, Inc. 108 (49): 50. 1996-12-07. Retrieved 2009-12-27. ^ "A Dose of Reality: Hit Me Baby One More Time: Week 4". The Trades (Burlee LLC). Retrieved 2009-12-27. ^ "Video Track". Billboard. Nielsen Business Media, Inc. 98 (8): 28. 1996-02-22. Retrieved 2009-12-27. ^ "List of Juno Award Nominees in Major Categories". The Gazette. 1986-09-09. p. E-4. Retrieved 2009-12-27. ^ "Launch Videos". MuchMoreRetro. Retrieved 2009-12-27. ^ "MTV Programming". Billboard. Nielsen Business Media, Inc. 98 (38): 57. 1996-09-20. Retrieved 2009-12-27. ^ "Musicline.de – Glass Tiger Single-Chartverfolgung" (in German). Media Control Charts. PhonoNet GmbH. This page was last edited on 5 February 2019, at 23:14 (UTC).